Clean 9 will help you begin to remove stored waste and toxins from your body and feel lighter and more energized. It uses products based on natural ingredients and lasts only nine days. F15 is the follow-up programme. It will change the way you think and feel about nutrition and exercise, and teach you how to make your weight-loss sustainable. It will help you build lean muscle, tone your body and complete your transformation. You'll feel and look like a different person! 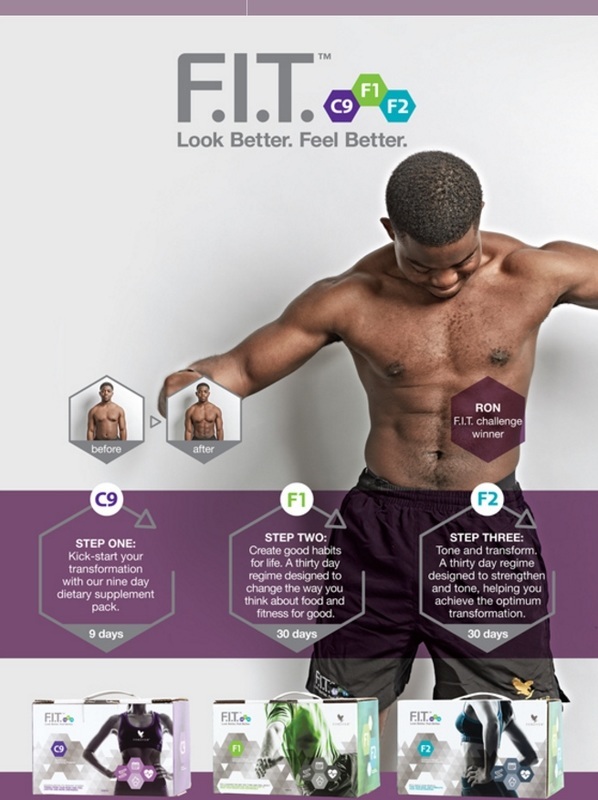 Together, these packs will help you get fit, and look and feel better! "You can achieve far more than you could ever imagine." Andre van Dalsen shares his #IAMFOREVERFIT story. The C9 and F15 packs are based on products from the Forever Living Products range, and therefore use the benefits of - among others - the aloe vera drinks,* which can have a cleansing and otherwise beneficial effect on your digestion and inner workings, as well as other health benefits. These and other products in the packs - all based on plants and other natural ingredients - can reduce your appetite, promote digestion, give energy, provide alternatives to regular meals (although after day 2 of the first pack you will be eating normal dinners every day). And there's a list of 'free foods', foodstuffs you can eat any time in addition to the products from the packs. The programme also helps you focus on excercise, and on the intake of fluids. Generally, all of this leads to excellent management of your weight (most people lose weight, although in some exceptions people with certain conditions use the programme the other way around), an increase in energy and a general feeling of well-being, and it can have some added benefits like improving the look and feel of your skin. To buy these products, click here. Please note: If you are suffering from a medical condition, and/or are on medication, it is advisable to discuss participation in the F.I.T. programme with your physician. Although children could benefit from certain parts of the programme, it is important to remember that the programme was tailored to adults, so if you are interested in having children participate in it, it is advisable to discuss this with a pediatrician first. Also, we would like to point out that Clean 9 or C9 is merely a nine day cleansing and weight management programme, and not a lifestyle. The F.I.T. 1 and 2 packs offer a better foundation for a long-term approach. In case of any questions, don't hesitate to contact us - use the contact page, or call 07552 398563 (UK). Weight management can be a hard thing to do, we know that from experience. We are fellow users, and we can help and support you. Let us know if you need us! *You may hear that the aloe gel drink doesn't taste very nice, and although some people feel that this is true, there are easy ways of dealing with it. A few quick tips: Have another drink handy, and after knocking back the aloe you empty the other glass. Or add juice to it. Or order the peach-flavoured drink as well and mix the two together. But the aloe drinks are so good for you that you really don't want to do without. They have unique qualities, all working together to bring goodness to your body, and in this case also for your weight management.